Size: 5.8" x 3.5" x 1.5"
This boxy calculator does not look like a Texas Instruments product. Nevertheless is the proof simple, just read the label on the back of the Electronic Calculator carefully. This Longines Symphonette Electronic Calculator aka EC is once again a calculator using the famous Texas Instruments Klixon™ keyboard technology. This knowledge reveals Texas Instruments Incorporated, Dallas immediately as manufacturer of the Radio Shack EC-200. The main difference is the lack of the lens above the display to magnify the size of the digits. This construction gives an idea of the date of introduction between June 1972 and September 1972. A similar calculator was sold by Montgomery Ward with the P800. We noticed two different versions of the original Electronic Calculator design, the featured one with mostly black keyboard caps and a later one with mostly white keyboard caps. 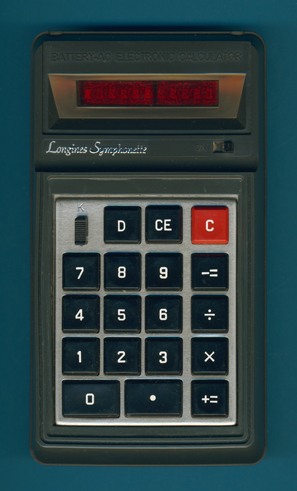 Don't miss the second version of the Longines Symphonette Electronic Calculator. Within few month this Electronic Calculator was replaced with a well know design. Don't miss the second generation of the Electronic Calculator based on the Datamath. Klixon™ is a trademark of Texas Instruments.